Amid all the excitement last week, some people have noticed that we also released an updated Raspbian image, and have been asking what is in it. Obviously, one of the most important features of this image is support for Pi Zero (which is also the main reason we didn’t make any fuss about it in advance…) But there are a few other small changes which apply to all versions of the Pi, so here’s a list for the curious. 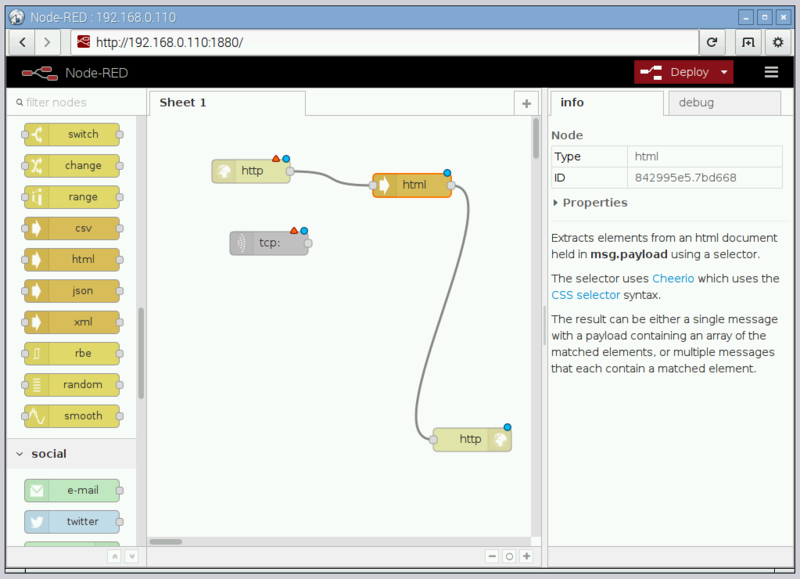 IBM’s Node-RED Internet Of Things application is now included – this allows you to rapidly create IoT applications by connecting blocks in a graphical editor. We’re going to run a full blog post on this in the near future, but for now have a look here for more details. To get started, run the Node-RED application from Programming in the main menu, and then use the web browser to access port 1880 at your Pi’s own address to see the editor. Under Preferences in the main menu, you will now find an option for Add/Remove Software. 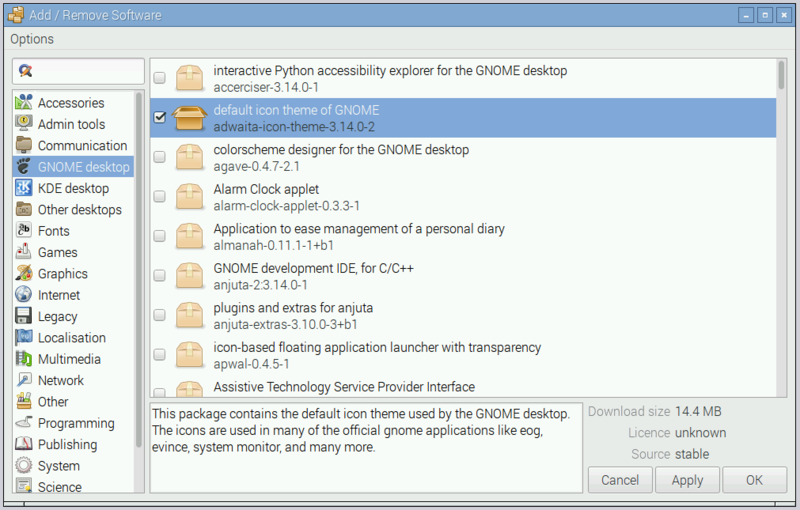 This launches a modified version of the Gnome Packages application, which allows you to add and remove software on your Pi. The window shows a list of categories on the left hand side, and there is a search box at the top – type in a search term to look for a particular package or feature. Software which is already installed appears in the list with a tick in the box next to it; software which is not installed appears unticked – simply click on the box to tick or untick it, and hit Apply to install or uninstall. One limitation is that you can only either install or uninstall in one “Apply” – once a package is selected for installation, you can’t select other packages for removal at the same time (but you can choose to install additional packages). Similarly, once a package is selected for removal, you can’t select other packages for installation at the same time. You will be asked for your password to confirm any installation or removal operations. The new GPIO Zero libraries are included, which vastly simplify access to GPIO pins from Python scripts. Read more about it in Ben’s blog here. Scratch has been updated. Changes include support for MIDI general instruments, improved support for the PiFace interface board and fixes for the Scratch mesh server, along with some bug fixes and minor tweaks, plus updated Japanese translation files. The Epiphany web browser has been updated – most of the changes are to improve playback of videos from sites such as YouTube and Vimeo. Many more videos should now play than in previous releases, and overall stability when playing video should be improved. This adds the option to “wait for network” at boot. By default, the jessie boot process runs as quickly as possible, but this can mean that the boot completes before a network connection is up and running, and this can cause problems in some applications that run at boot. By selecting this option, boot will not complete until a network connection is established, but at the cost of making boot-up take longer – this is disabled by default, so if you are having problems with applications which need a network connection, try enabling it. This option has also been added to the raspi-config command-line application. but bear in mind that this won’t add the new packages listed above – use the individual apt-get install commands above to add those. As ever, feedback is very welcome, and I’ll respond to as much as I can. We love that you keep on working on this! Great work, can’t wait to try out Node-Red this weekend. I had discovered that some images (e.g. PiCore) don’t boot on the Pi Zero. Any chance of instructions on what needs changing to support the Zero? Both for image builders and end users. You just need the latest firmware, but adding that to the various distro is down to the distro supplier. As usual the boot sticky has info about it, this time written by Dougie. What about kernel support for Docker? I already noticed the Jessie image containing these nifty little tools. Great! However, I’d like to know what ‘Overclocking’ in raspi-config does on my Pi Zero – does “none” select 1000MHz despite telling me 700MHz? Hat tip to all of the staff! On Pi Zero, you should just leave overclocking set to “None” (which selects the default clock speeds set for the device in the firmware, i.e. 1GHz on the Zero) – all the other options will actually slow your Pi Zero down! This will be corrected in the next release – Pi Zero basically comes out of the box running as fast as it is safe to run it. Thanks for your swift reply, Simon! Really great news – this has fixed the wifi problem and I can now use internet without the cable! I spoke too soon about the WiFi. I’m using the ‘official largish white topped RasPi WiFi dongle’. On the first card and Pi I updated the dongle switched and worked automatically. On the second if I set to SSID it finds the network but does not fill in the boxes nor ask for the password. What do I have to change to get it to work? Raise a post on the forum for help with this. Please use the forums for tech support – not likely to get much response on the comments section. You need to be running jessie to start with, so that the jessie repo is selected in apt. Also don’t forget to run the apt-get update first to update the package list. Please forgive my ignorance, as I am new to the Pi world, but how do I upgrade to or get Jessie? i have tried sudo apt-get update, upgrade, and dist-update before trying to install the new packages, but nothing has worked. This forum thread shows you how to upgrade, however I would recommend you start with a new fresh Raspbian download if it is convenient. These is great stuff again. I am particularly excited about the addition of the node-red package. Good job guys! You should knock off early for the holidays! Thanks for this, very much appreciated! Was the double click touchscreen issue solved? Is it possible to configure the “wait for network” from the command line? Sure – either “sudo raspi-config nonint do_wait_for_network Fast” to not wait, or “sudo raspi-config nonint do_wait_for_network Slow” to wait. Thanks for the updates. Will we see Epiphany supporting github any time soon (eg. forking)? Probably not – Epiphany is optimised for performance, and this results in minor compatibility issues with some sites. IceWeasel works pretty well on Pi2 – “sudo apt-get install iceweasel” – pretty much everything should work in that, but it’ll be slower than Epiphany. Not forgetting that there is now a Raspbian Jessie Lite image – 375MB zipped, 1.4GB uncompressed, so it fits on a 2GB SD card with some room to spare. The Lite image comes without the desktop and is ideal for terminal servers and headless projects such as robots, webcams etc. I’d like to, but currently don’t have/want a github account (thanks to their account policies). Maybe someone else (e.g. from the linked forum thread) who has/had the same WiFi issues can create a ticket. 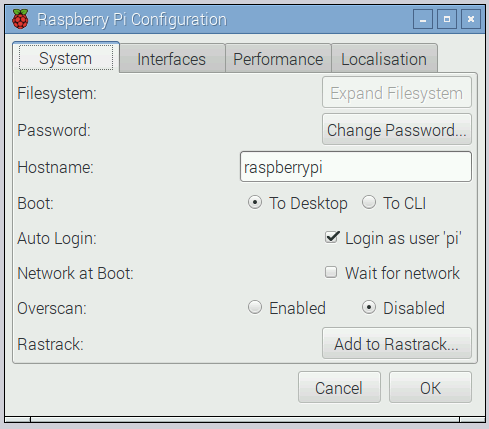 Is there going to be a way to make raspi-config work without having the username as pi? Under Preferences in the main menu, you will now find an option for Add/Remove Software. I have followed your instructions to install the updates but no option appears. I have the new Jessie installed and I tried rebooting – No change. To make the add/remove software appear on the Preference menu I used the Main Menu Editor. There are some Gnome GUI tools for account management which are on the “to do” list – for now, this can only be done via the command line. They are not ‘broken’. See forum posts in this subject and the already dealt with github issue. Part of this is actually a general Linux issue. Just looking, has Processing 3 been moved? I got my first pi (zero) a couple days ago. How do I update since it doesn’t have WiFi? Thanks. If you have no network connectivity from the Pi itself, you’ll need to download the latest image and copy it to an SD card with a PC. Excellent update on latest release. Works perfectly, for me, on RasPi B 256K and 512K versions, B+, B2 and of course the Zero. It is great to see planned consistency to support users of legacy RasPis. That is a very welcome change from the strategy of commercial computer suppliers whose prime goals are raising revenue through deliberate obsolescence policies on their systems causing waste and harm to the environment. It just needs a further push to truly Open Source the RasPis so as to expand the platform’s engagement further with the FOSS programming community. Not to mention harm to the consumer, people, organizations buying the product. Both financial and time. Great to see Pi Zero supported – I haven’t been able to get TightVNCserver or X11VNC to autoboot on the Pi Zero. I’m hoping the ‘delay until network running’ option might fix this. Has the NOOBs package on your website been updated to include this latest Raspbian image?. Yes, NOOBS is up to date with this image; it’s also had a few tweaks itself. I am using RealVNC with Jessie as there are easy instructions on their website on how to make it automatically run at boot. Ping seems to need sudo in both the lite and standard Raspbian images. is it possible to add the newest “Arduino 1.6.6” to the Raspbian Jessie (and wheezy) repository? currently there is only an old “Arduino 1.0.5” available only. 1.0.5 is the stable version that the Debian maintainers have chosen to include in jessie; we have no control over this. (They haven’t updated from 1.0.5 even in the stretch and sid versions of Debian, so it looks as if there isn’t a new version in the pipeline as part of Debian.) If you need a more up-to-date version, you’ll have to download and build the source. Simon, you rock! All these awesome and highly relevant improvements and tweaks and what is sure to keep your competition in the SBC world at bay, as “the other guys” tend to not do any such comparable developing (and their Linux distros tend to be awash in ugly bugs). If this works smoothly, then I call this a *huge* achievement for the Raspberry Pi ecosystem! HD video on a $5 computer would be insanely fantastic! Please keep up the good work Simon, and I hope in time the Raspberry Pi foundation can afford to hire more awesome developers like you. I also hope you get a raise! Efforts like yours are what I would call the Raspberry Pi’s “unique selling proposition”, in comparison to other SBC’s. Do all of these new packages not work with Wheezy? pi-package, node red and gpizero are not downloading. What’s the status of QT 5.x (with Wayland support) Libs? Are they in the default distro yet? A news feed is added here for updated Raspberry PI Image. As we’ve said before, work on Wayland is shelved for the time being. We are looking at alternative options for compositing which fit better with the Pi’s architecture. Search in the Forums about Wayland. Myself, I have *no* expectation for the Raspberry Pi Foundation to do any “trail-blazing” when it comes to Wayland. I feel such trail-blazing is best left to billion-dollar corporations like Redhat, or volunteer OSS enthusiasts on their own time. I mean come on, the Raspberry Pi foundation is a non-profit organization! Let’s not expect the moon from them. They are already miracle workers, never mind Wayland. Wayland will come in due time, and it may still be years away. I really like the choices Simon Long is making (or whomever it is at the Foundation who makes these choices) as to which problems he is tackling. These are smaller, more realistic bugs to kill, which go a *long* way towards usability. I love seeing all these shorter-term gains in the Desktop experience! *If the Pi is going to be appealing to kids, it must have its roughest edges smoothed out first*! To me, Wayland is more of a performance optimization, more like “icing on the cake”. Any “make-or-break”, obvious usability improvements (for Noobs) are much bigger wins, IMHO. Try to think like a Noob: what would they get commonly stuck on? It’s thinking like this, which I feel will really help OSS win. I’m a noob myself, and just an average user, maybe to much used to the shines of Apple’s OSX. But I’m more and more attracted to FOSS, Linux, and the Pi in particular, I can’t help looking forward to seeing great compositing on my Pi. And since Collabora was working on it, showed some nice things, I thought development was still on track. I wonder if Ubuntu MATE for RPi 2 supports Wayland yet, or is about to. that being said, I understand what are the priorities of the foundation : getting people to learn how to develop, and makers to make great inventions. but the package obconf is not included and must be downloaded. Except that all seems OK and works out of the box. The command ‘sudo apt-get install nodered’ does not work and as far as I can see nodered package is not in the raspbian repository. You will need to be running jessie, and to have done a “sudo apt-get update” first. I’m concerned about my SD Card wearing unevenly and wondered if they’ll be any plans for an easy set up for Raspbian, using the “f2fs” file system for handling the numerous read write cycles which wear the SD Cards unevenly / excessively ? Modern SD cards have write cycle counts in excess of 100,000 (and that’s a very conservative figure) before they will start to slow down, and the controllers on the cards already do access levelling to spread the load evenly. I don’t think we’ve yet seen a card fail due to an excessive number of writes at Pi Towers, and as you can imagine, we hammer them quite heavily. Particularly given how cheap an SD card is these days – even a good quality SanDisk is under £5 – it’s really not worth worrying about, and I don’t think it’s worth risking a fairly new filing system (with all the attendant problems that it may introduce – f2fs only appeared in jessie; it didn’t exist in wheezy or earlier versions of Debian) to fix the issue. Really like Node-RED but worth noting that the edit boxes in Nodes such as ‘template’ and ‘function’ do not work correctly in Epiphany- i.e you cannot edit ! We’re aware some parts of NodeRED don’t work well with Epiphany, and are looking into it. In the meantime, if you are using a Pi 2, I’d suggest installing IceWeasel – all seems to work fine in that. “sudo apt-get install iceweasel” should work. It’s a very good idea to do a lite version of Raspbian. raspi-config has various dialogs which do not work (well) on a 640*480 screen. They tend to fall off the bottom and cannot be made to work unless the Font size is set to an impossible 7pt. It is possible to Grab and Throw off the top of the screen, but this is not very elegant and impossible to drag back down. Unfortunately, this is a generic problem with LXDE and GTK – it isn’t designed for small screens, and many applications (not just the ones I’ve written!) will not fit on them. GTK intelligently resizes windows around the elements (buttons, text boxes etc) on them, but there is a physical minimum size below which a window can’t shrink. There is therefore a decision to be taken about whether to make a dialog small and thus make it less convenient for people using large screens (as they will need to page through multiple tabs), or to make the dialogs a sensible size and accept that they won’t work well on small displays. I’ve taken the decision that the latter is the right thing to do, but I do accept that it isn’t going to be ideal for everyone, for which my apologies. One can use Alt+Left Mouse Button to move the window. I think it should be possible to use at least composite video screens to configure everything, but it is OK to move the window around to do this. This comment is a bit late, but it occurs to me that the official display is only 800 x 480, and I cannot work with a browser on that resolution, because the default dialogue windows for, e.g., uploading a file are bigger than that size for some web applications. Why on Earth is the “official” display unusable with the default web browser? Because Epiphany is a standard piece of Gnome desktop software, not something written specifically for Raspberry Pi. We have optimised its performance in some areas, which means that of the browsers we have tried, it performs best on Pi, but at the end of the day it is a desktop product and you are trying to use it on a mobile-sized screen. There will be numerous standard Debian applications which won’t be perfectly usable on the Pi display; we simply do not have the resource to rewrite everything for compatibility in every situation people might try. I’d taken the first Jessie release (in September) and slimmed it down to around 1Gb (following various guides on the internet); but you can’t beat an official version from the Foundation. PLEASE simplify the network functions! I run an afterschool program. My students have been without Wi-Fi since the introduction of jessie. We’ve been focusing on Arduino lately but I want to get back to Raspberry Pi curriculum especially with the inclusion of bluej and greenfoot and now nodered. I think Add / Remove Software is the most interesting addition. I used Aptitude from CLI before. What does “Only Native Packages” under Options-menu mean? I request a new feature: It should be possible to select only packages that create a menu entry. E.g. Wolfram has only a CLI, but it is still in a package that installs menu items. This would be good for beginners because they probably prefer programs that are easy to start. (Full desktop image based on Debian Jessie). I think it should say in the release notes for the lite version what was removed. How to manage pppoe connection on Raspberry pi 2 ? Is 16 gb memory card better than 8 gb memory card for Raspberry pi 2 ? Where on GitHub is the source code for PiPackages/pi-packages? Thanks for your sharing, I’ve learnt so much more about Linux.